Oh, my, how the tables have turned! It seems like just yesterday we were deadlocked in a buyer’s market where a seller had to do just about everything a buyer asked to become “the one.” Reminds me of dating in college. I digress, enough about me. Everything was bad during that buyer’s market. Bad job outlook, bad stock market, bad media coverage and bad attitudes. Well, I guess there was one good thing, though; the housing market, if you were a buyer. Fast-forward to summer of 2014 and a lot of buyers are frustrated with multiple-offer situations, even if they find THAT one good enough to be THE one. Here’s a thought: Offer what the sellers are asking! Give your buyers the assurance (with a disclaimer of not having a crystal ball, of course) that real estate values are back on the rise again making their chances of gaining equity a few years down the road a lot more likely. I like to call our offer price in a competitive situation “aggressively realistic,” meaning that it needs to be realistic based on the market values, but aggressive enough to get the house if they actually want it. Be real. Be aggressive. Heck, be really aggressive. 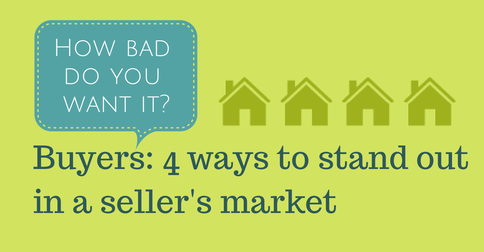 Want to show a seller how serious your client is? Consider putting 10 percent or more down in earnest money. This may seem risky for some, but hey, earnest money is there for a reason. If your client is uncertain about putting a “noticeable” amount of earnest money on the table, it may be a sign that they are uncertain about the house itself. Assuming your client holds up their end of the bargain and they have the right contingencies in place, it won’t cost them any more in the long run since it goes towards their down payment if financing is involved or general purchase price if it’s a cash deal. Make sure the offer is uncomplicated. Sure, it would be nice for that wicker furniture on the deck to stay or that carpet stain in the bedroom upstairs to be professionally cleaned, but how important is it? Ask your client if they are buying wicker furniture or a home. Are they buying clean carpet or the fourth bedroom for their growing family? Keeping the terms simple might be worth a lot of money to the seller. Especially considering the seller has enough to think about and do prior to finding, negotiating and closing on a new home of their own. Where do you think carpet cleaning falls on that list? Find out what terms are important to the seller prior to writing the offer. If your buyer is flexible on closing date, or doesn’t care that the flat-screen mount stays in the living room, ask the seller’s agent upfront what you can do to make the offer more enticing to the sellers. Maybe they want a longer escrow, or the option to take their washer and dryer with them. If your buyer is flexible, this could help them look like the best “pick of the litter” if the home goes in to multiple offers, even if they don’t have the highest offer price. Above all, don’t let your clients be bummed out if they lose a house to another buyer. Usually, it takes only one “low” offer and a lost home for the buyer to get real on the next one. Consulting your buyers on what price to offer can be tricky. The best advice that was given to me early in my career is to simply ask them how bad they want the house. If they put their best foot forward and don’t get the home, they and you can feel great you did your best. The last thing a buyer wants to feel is regret for not trying harder, or for choosing the wrong agent.